Get these iPhone deals while they last. The holiday sales may be over, but there are still discounts to be found on the latest generation of iPhones. And with starting prices ranging from $749 for the XR to $1,099 for the XS Max, you're probably looking for any way to save on the expanding price tag of your favorite flagship phone. Fortunately, both service providers and retailers are offering a bevy of incentives and promotions in order to give your wallet a break. Just note that some deals don't provide a clear end date, stating only that they'll be available "for a limited time." So while you should certainly never rush into any commitment or contract with a service provider, remember that these deals won't be around forever. AT&T is offering a significant discount if you're buying more than one phone. The current BOGO deal requires a new line and the purchase of an iPhone with a $750 minimum value. Just note that the maximum discount is $750 and you'll still have to pay taxes on the full value of both phones at the time of your purchase. The discount on this deal is paid out as a monthly bill credit, and you will be responsible for the remaining cost of the "free" phone should you cancel the new line. AT&T will also take your current phone, with a credit worth up to $300 on an iPhone 7 Plus. This means you'll to find a friend or family member, and give up your older device for the most savings on this offer. There's a ton of fine print to this deal, so be sure to read the terms and conditions directly from AT&T before you make any decisions. For longtime AT&T customers, consider talking with the loyalty team about canceling your plan. Doing so may get you an offer of $450 off a new device. There are no guarantees, but many Slickdeals members have been able to talk their way into this awesome discount. Want to get a little bit more value out of your current phone, while stepping up to the latest iPhone? Well, Verizon may have a deal to multiply the value of your trade-in. If you're upgrading to an iPhone XR, XS, or XS Max, you can get a $100 back in the form of credits applied directly to your account by trading in an eligible phone. The credit will be paid out in installments over the course of 24 months. You can also get $300 in credit over the same period if you decide to add a new line as part of your device upgrade and trade-in. These credits are in addition to the trade-in value that Verizon offers for your device. You can find the entire list of eligible trade-ins on the Verizon website. US Cellular may be a smaller carrier, but they are offering big savings with a truly "free" iPhone XR. You have to sign up as a new customer under a Total Plan line with Unlimited Plus Data and port-in required. The iPhone XR must be financed for 30 months and the credit will be paid out over that period. Device protection is also required during that time, starting at $9.99/month. This may sound like the perfect opportunity to pick up a new XR for free, but be sure to check coverage in your area and read all of the fine print before jumping at this opportunity. Sprint is offering a BOGO deal of their own. If you lease an iPhone X, XR, XS or XS Max for 18 months with Sprint, you can pick up a "free" iPhone XR (via bill credits). This special is only valid if you get two new lines of service, or simply upgrade your device and get a new line. If you are looking beyond the XR, you can also get up to $550 off either an iPhone Xs Max or Xs with the same requirements. Similar to the AT&T deal, canceling a line early will require the remaining balance to be paid. And as usual, there are a lot of terms and conditions on this deal, so be sure to visit the Sprint site to learn more. For a limited time only, T-Mobile is offering customers up to a $390 trade-in credit if you meet certain requirements. 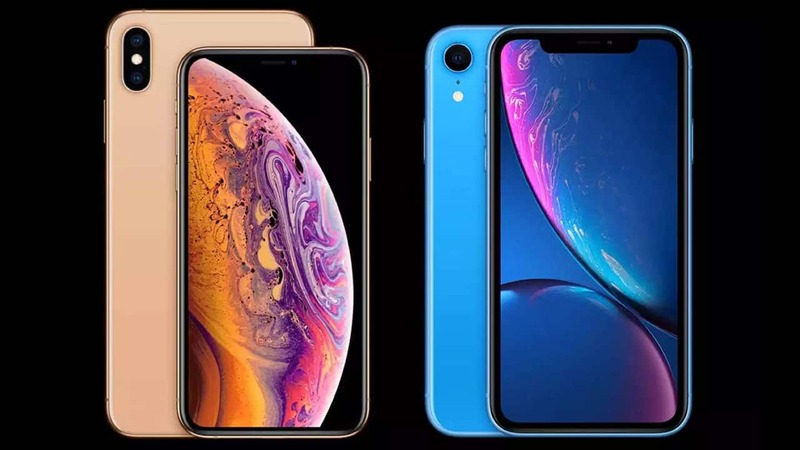 You must purchase an iPhone XR, iPhone XS, iPhone XS Max on a monthly payment plan, add a new qualifying line of service, and trade in an eligible device to see the $390 bill credit. There are also promotional trade-in credits at levels of $360, $250, and $150 for older iPhones, as well as for devices from Samsung, LG, and more. Check out the full list of requirements, along with all of the eligible phones that you can give up for the trade-in credit, on T-Mobile's site. Get a credit of up to $450 towards a new iPhone XR, XS, or XS Max when trading in an eligible phone with Apple. The size of the refund depends on the model of phone you're turning in, but it doesn't have to be an Apple phone to qualify. Apple promotes the deal by showing an iPhone XR for $449 or iPhone XS for only $699. The fine print explains that those prices are with the trade of an eligible iPhone 7S. The max credit of $450 is for an eligible iPhone X trade-in. If your phone is not eligible, Apple will still recycle it free of charge. You'll have to check the Apple website to see if your phone qualifies and for a breakdown of promotional credits.